A life cycle describes the series of stages that an individual organism passes through between the time it is conceived until the time it produces offspring of its own. This series of stages is referred to as a life cycle because offspring pass through the same series before they produce their own offspring. Hence, the life cycle is repeated each generation. The basic stages of a life cycle for all organisms include a prereproductive (or juvenile) stage in which individuals grow and mature and a reproductive (or adult) stage in which individuals produce offspring. However, species vary tremendously in the particular aspects of their own unique life cycles. Differences among species in the basic life cycle often reflect adaptations for surviving and producing offspring under different ecological conditions. For example, some plant species live in habitats in which they are able to grow, mature, and reproduce in a single growing season. In less fertile habitats, however, plants may not grow enough to successfully complete their life cycle in one year. Consequently, plant species in these habitats may have life cycles with longer prereproductive stages. In addition to being affected by environmental conditions, life cycles are also influenced by patterns of energy allocation. Energy that is used for growth or metabolism cannot also be used to produce offspring. Therefore, adaptations that increase survival or reproductive success in one life cycle stage may reduce survival or reproductive success in other stages. This situation is referred to as a trade-off. One example of such a trade-off is related to the length of the reproductive stage. Some organisms, including humans and perennial plants, have long reproductive stages and may reproduce many times during that stage. These types of organisms are said to have iteroparous (repeated births) life cycles. In contrast, salmon and annual plants are examples of species with semelparous (single-birth) life cycles. In this type of life cycle, individuals reproduce only once and then die. Intuitively, iteroparous organisms might be expected to produce more offspring than semelparous species. Due to the tradeoff in energy allocation, however, semelparous species can, in some cases, be more successful in producing offspring than iteroparous species despite the fact that they only reproduce once. Because semelparous species do not survive after reproducing, they can allocate all available energy to producing offspring. Under certain environmental conditions, this extra energy allocation can result in a larger number of offspring than an iteroparous species that must reserve enough energy to survive. The life cycles of different species may also vary in the type of reproduction used. Many species are capable of reproducing asexually. In this type of reproduction, a single parent produces offspring that are genetically identical to themselves (and to each other). In some cases, offspring are produced by budding, where an individual grows directly out of the parent and is eventually separated to become an independent organism. This form of reproduction is common in plants and cnidarians (for example, sea anemones). Other species reproduce asexually with eggs or seeds that do not require fertilization . Several species of crustaceans and some lizards can reproduce asexually by producing these types of eggs. Organisms that reproduce through the fusion of gametes (eggs and sperm) from two parents are said to reproduce sexually. In this mode of reproduction, offspring differ genetically from their parents because they represent the combination of genes from each parents. Offspring also vary from one another because of differences in the particular genes inherited from each parent. Sexual reproduction is the only form of reproduction for most vertebrates and many plant species as well. Although asexual and sexual reproduction are presented as contrasting modes of reproduction, many organisms are capable of reproducing both ways. These organisms often reproduce asexually when environmental conditions are favorable for growth and reproduction. As conditions deteriorate, however, these species can switch to sexual reproduction and produce more genetically variable offspring. In many plant species, a single individual is capable of producing both eggs and sperm. Furthermore, these plant species can often fertilize their eggs with their own sperm, a process known as self-fertilization. This form of reproduction is still classified as sexual, but does not produce as much genetic variation among offspring as when eggs and sperm come from different parents. Spawning sockeye salmon run the Fraser River in British Columbia. When salmon mature, they migrate back up the same river in which they were born to reproduce and complete their life cycle. For some organisms, including humans, individuals in prereproductive and reproductive stages are morphologically very similar to one another. Although they may differ in body size, the two stages have similar appearances, live in similar habitats, and consume similar types of food. This type of life cycle is referred to as a simple life cycle to emphasize the similarity of individuals in different stages. In clear contrast to organisms with simple life cycles are organisms that change morphology , habitat, and diet as they move from one stage to the next. These organisms have a complex life cycle. One example of a complex life cycle is that of the monarch butterfly ( Danaus plexippus ). Like all butterflies, prereproductive monarchs are worm-like caterpillars. After growing and molting four times, monarch caterpillars build a cocoon and enter a new stage of their life cycle, the pupae. In the pupal stage, monarchs undergo tremendous morphological change (metamorphosis) and eventually emerge as adults. Adults are morphologically distinct from caterpillars, with long legs, antennae, and wings. As adults, monarchs are capable of traveling long distances in search of food or mates. Complex life cycles occur in a wide range of plant and animal species. Aquatic insects found in lakes, streams, and ponds have juvenile and adult stages that are both morphologically distinct and occupy different habitats. Whereas juveniles are typically found in the water, adults are often terrestrial flying insects. As these adults mate, they deposit fertilized eggs at the surface of water bodies, where juveniles will hatch and grow. Some organisms are considered to have complex life cycles, not because of morphological changes, but because of changes in habitat. For example, many birds migrate long distances between their summer breeding grounds and their more southern wintering grounds. 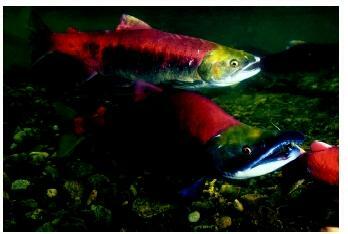 Anadromous fish, such as salmon, also migrate between rivers and streams where they are born downstream to the ocean. Once in the ocean, salmon will continue to grow and eventually reach reproductive maturity. When salmon mature, they migrate back up the same river in which they were born to reproduce, thus completing their life cycle. Ebenman, B., and L. Persson, eds. Size-Structured Populations: Ecology and Evolution. Berlin: Springer-Verlag, 1988. Roff, D. A. The Evolution of Life Histories: Theory and Analysis. New York: Chapman and Hall, 1992. Stearns, S. C. The Evolution of Life Histories. Oxford: Oxford University Press, 1992.